How to get a persistent reference to a keychain item for VPN usage? I'm currently trying to establish a custom VPN connection via the Network Extension Library (NEVpnManager). The NEVpnProtocol can receive a reference to a password that is stored in the apps keychain so that the user doesn't have to enter the password every time he logs in. No matter what I do, the user has to enter a password, or I can't save the NEVpnManager Settings. As you can see here NEVpnProtocol.PasswordReference needs a persistent reference to work, otherwise it won't work. Sadly I don't completely understand the objectC Code behind this link, that's probably why I can't get this to work with Xamarin. IPC probably means Inter Process Communication, allowing different processes to communicate, so I think my problem is that the NEVpnManager can't read the password because it is "persistent". Is it possible to store and receive the log-in details in a way so that this works like intended ( = user won't be asked for a password)? Any help is appreaciated, thank you in advance. Finally, here my complete code, with the code not working ("IPC failed error") and the code working but with a password prompt (in comments). Please note that in this stage of the coding process the user can't choose a username / password. I was also working on this and didn't find a solution. 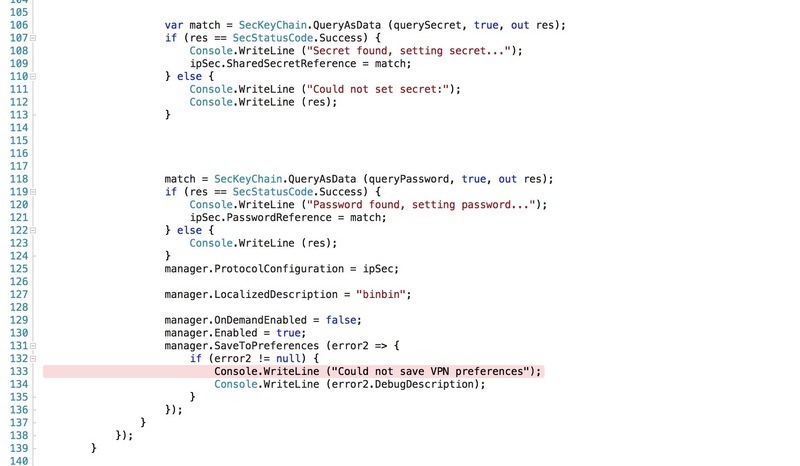 Xamarin should really give an answer because it looks like there is bug in the VPNManager thingy. Did you get VPN via IPSec working? It also needs a reference to the Keychain for the Shared Secret, which i can't get to work either. Again I get the "IPC failed" exception when I try to save the VPN settings. @Tobe Nope, didn't get it to work. First problem was that I didn't have a persistent reference which is needed. After aquiring one (just like you did) the reference didn't work. So I think theres a bug with Xamarin not returning correct references. Yes I can run that code, but as stated above it crashes because I can't get a persistent reference to the keychain. I don't need VPN support anymore for my app, so I stopped working on this. Of course IPSec and saving passwords does not work because of the keychain problem, but the rest works fine. This does not work on a simulator, so you need to run this on an actual device. And of course change username, password etc. Android Support is not implemented, this was only a small test for iOS. Why can't I run here? Did you enable VPN support in your entitlements.plist? (see attached screenshot) Did you change the protocol to iKev2? 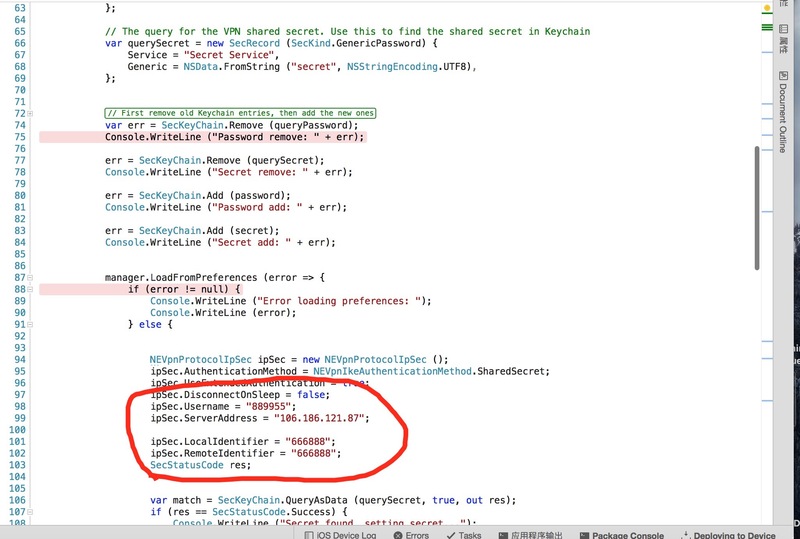 In that code you are using the ipSec protocol which requires a persistent reference to the iOS keychain to retrieve the shared secret. You can't save the connections to settings because the persistent reference to keychain does not work. Please read the very first post of this thread were I explain this in detail. 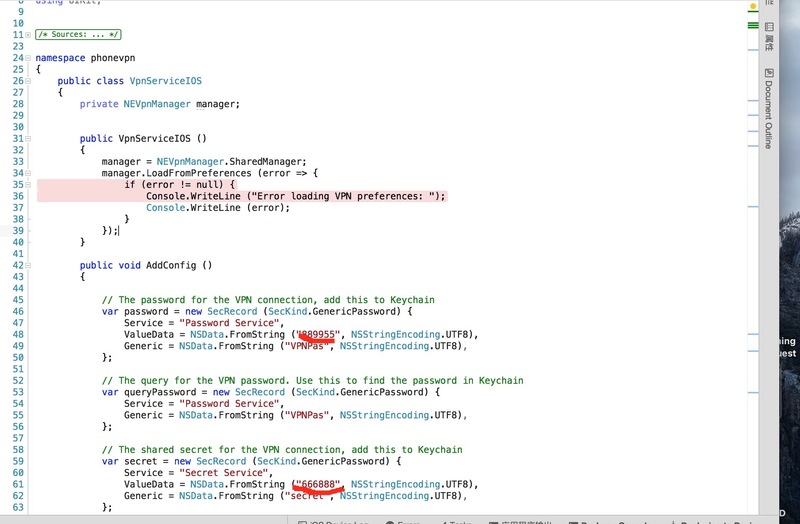 If you need a VPN connection with Xamarin for iOS, the only possibility I know and that worked on my testing devices is a VPN connection via iKev2, I never got ipSec to work because of the keychain problem. No solution yet? I have a Xcode project that can run normally. Can you help me to change it? ipSec does NOT WORK with Xamarin iOS. I don't know, but probably it's a bug. References to keychain must be PERSISTENT. That is not working for me (maybe bug). I have a Xcode project, can be connected, you need to refer to it? I don't know how XCode projects work, sorry. I'm completely new to iOS development. NEVpnProtocol.PasswordReference needs a PERSISTENT REFERENCE TO KEYCHAIN. You need: SecKeychain.QueryAsData(SecRecord query, Boolean wantPersistentReference, out SecStatusCode). That is not working with Xamarin as it seems. How much is your mailbox, I sent a xcode project to you, help me find it. Dude I have no idea how that works... sorry... Please contact Xamarin support. I have the exact same problem as Tobe. No persistent reference or IPC failed when saving. Did anyone learn anything from Xamarin? Clear statement that it does not work at least. Any updates regarding this issue? I have the same problem. 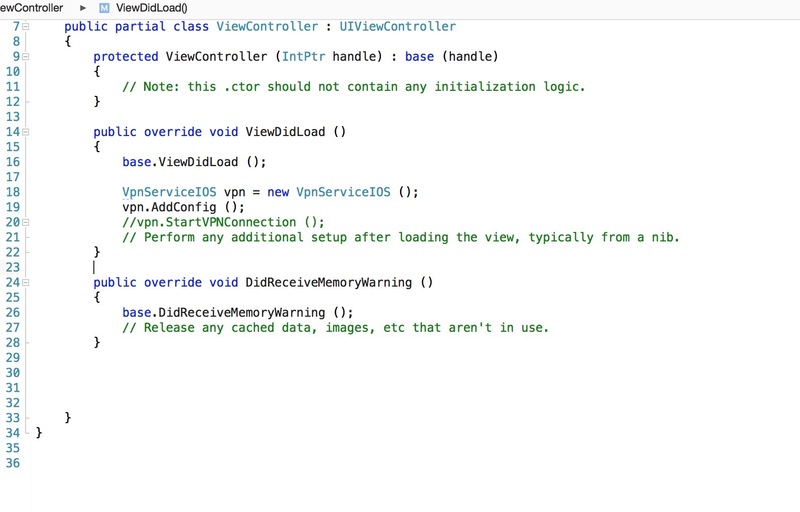 I am having issues with this with latest Xamarin and XCODE. The problem I get is IPC Failed on LoadFromPreferences() when using the emulator, and "Permission Denied" when attempting to use a real device. Has anyone followed this up with Xamarin yet? Is there a way to achieve IPSec connectivity using Xamarin? You can't use it with the emulator as far as i know. Make sure you have permissions for VPN and keychain access for the app. You need a new provisioning profile for the VPN access. I didn't have to pursue this anymore, so no idea if it works or if there's still the password problem. I try whole day to get persistent reference of keychain items using Xarmarin.iOS. At the end, I gave up. I create a native library. And call the object-c native code to get the persistent reference.